KF, I LOVE the looks of that RTP. After the flying my test hack (henceforth known as "The Hack") I decided that the wing needed two inches more span to handle the torque on takeoff. I simply enlarged the drawing spanwise. The original drawing had too many ribs so I decided to make the wing and the tail surfaces out of 3/32" stock and simply sand to a symmetrical airfoil. I flexed the structure and added gussets where needed. The covering was red Esaki tissue applied with glue stick. It was shrunk with rubbing alcohol but not fixed. The tail section was simply glued to the tube. To attach the wing I glued two lengths of 1/8" square stock to the bottom of the wing a quarter inch to either side of the center line. I wrapped a piece of fine sandpaper around the tube, set the wing on it and moved it back and forth until the wing sat flush on the tube. The 1/8" square stock was now contoured as a wing saddle. The tether wire was wrapped around a dowel the same diameter as the tube and then slipped over the tube. The landing gear wire was bent like it was made for an ROG model with a 1/8" stick, then the top section was bent back about 85 degrees and bound to the bottom of the tube with thread and CA. The rules said it had to have a canopy so I glued an old Enterprise bubble canopy on top of the tube. Now I put rubber in the fuselage, wound the motor and let it unwind, and found the CG. I slid the tether wire to the CG and tacked it in place with CA, then positioned the wing and glued it in place. Now, all I had to do was key the tail cone, run a prop shaft through it as a rear hook, and I had a fuselage. The tail cone I had to make. I cut a 1/64" plywood base disk using a compass then rough cut out six 1/8" thick disks also with the compass. Using the compass left a hole in the center of each disk so I could put a pin through it to line them up for gluing with CA. When the CA had set, about a minute later, I put the stack on a Dremel tool mandrel and chucked it into the tool. I put on my mask, turned on the tool, grabbed my sanding block and 90 seconds later had a tail cone. Finally, I got to work on my model, the Speed Merchant. I decided to go with the rolled tube version since Bill Watson gifted me with a rolled tube he made for his model that apparently did not meet his specs. I found it to be a very nice tube. He made it the way I do by rolling the wet balsa and a layer of wet silkspan around a mandrel. He lets his dry overnight. The silkspan drys first and wicks the moisture out of the balsa. I'm not that patient so I bake them in the oven. Since my wife is not retired and I am a house husband I can get away with it. Now to make the nose cone and tail cone. As it turned out I had the nose cone already made, I found it in my junk box. It was the nose cone from my "Unintended" P30 that was destroyed in the opossum invasion last year. 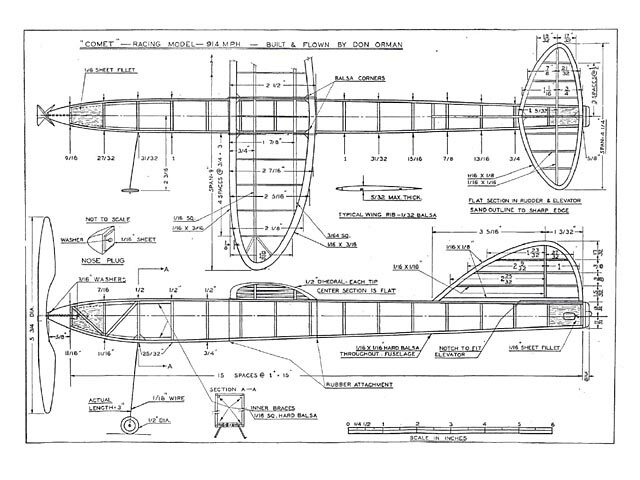 It was for the same diameter rolled tube fuselage. All I had to do was replace the prop with the aggressive Ikara prop that I have been testing and install a new prop shaft. Very interesting Howard...I look forward to your next model. Thanks for sharing the video! No rush KF, I was wanting to see this in action. kf, interesting rules. I assume some photos will be posted of the attempts to help us? With videos if I can get good ones. Looks like a lot of fun...please keep us informed!!! The B.L.U.R. race is for scale models. (And when I have seen it was fun to watch.) The RTP race is for pure speed models. The Covered Motor class simply has to have a canopy, that's for "plausible scale". The Unlimited Class can be a motor stick model. Push/Pull designs have been suggested but they must R.O.G. The Speed Merchant is a similar model to the Comet Racer, and other speed models of the 1930s, with a 9 inch wing span and is 22 inches long. The difference is that is intended to be tethered at the wing tip to fly in a circle. This is something the Black Sheep Squadron did many years ago and it was decided that it would be interesting to revive the contest. I might also be fun to fly these things outdoors on a B.L.U.R. course. Ian, I have that plan, but never found anyone to be a mentor to build one and as strat-o stated what are the rules. Speed models have a long history it seems. 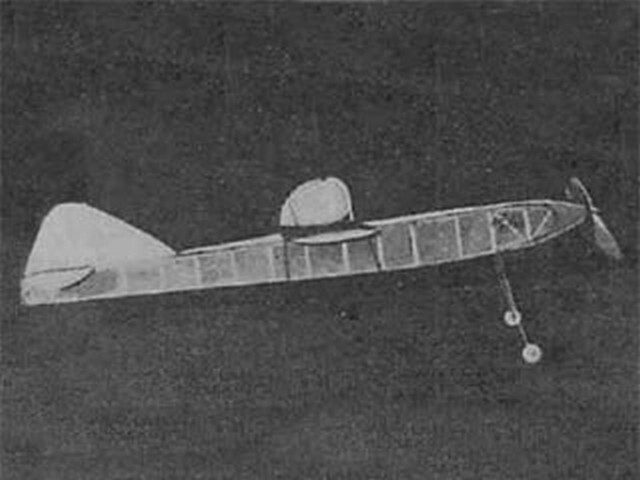 The Comet Racer by Don Orman had a 9" wingspan and appeared in the August 1938 issue of Air Trails. Speed models might raise the interest of some of the younger generation.